We can generalize that contemporary usage of the word huaso refers to an excellent horseman with gentlemanly ways who identifies with the hacienda. It is worth noting that such was not always the case. The Chilean ranch hand had a reputation of being an excellent horseman early on in the history of this country, but “gentlemanly” seems to be a more recent distinction. The first reference to the word huaso did not come about until 1743. It took more than 50 years to see it crop up in the literature again, and this time is was in describing an Argentine. The word has also been used in Peru. Its origin is not certain. It appears in the early literature as both “huaso” and “guaso”. “Guasa” is a similar Spanish word from the province of Andalusia that is used to describe someone who is ungraceful, unperceptive, not very astute, and slow-witted but with good intent. This same region of Spain that has so strongly influenced the Chilean huaso called a risk taker or a person who made fun of others to the point of hurting their feelings, a “guasón”. On the other hand, Don Rodolfo Lenz’s Etymological Dictionary states that the Quechua word “huasu” refers to something that is rustic, coarse or vulgar. In Ecuador, the word “huazo” refers to someone who is uncivilized, uncouth and impolite. In Cuba, a “guaso” refers to someone that is unrefined and wild. There is frequent mention of comments made by the famous author of historic literature, Benjamín Vicuña Mackenna, regarding the words “huaso” or “huasa”. He points out that these words were used in both the Quechua and Mapuche languages and that they make reference to a person’s back, or carrying something on one’s back. The theory was that since Native Americans saw the huaso on horseback all the time, they described him in this manner. This explanation seems a little weak, since the term really was not commonly used until 300 years after the Native Americans had first seen men on horseback, and by then no one spent more time on horseback than they did. The fact that similar words can be found throughout Latin America where Andalusian conquistadores were an important part of the colonization would tend to give more credibility to the Spanish origins. Regardless of whether the genesis for the word “huaso” is Spanish or Quechua, there is little doubt that the huasos in the early history of Chile were a rowdier breed. In the 16th and 17th centuries, the Chilean ranch hand dressed in coarse ponchos, baggy pants, crude sandals with huge overlying metal spurs and a medieval, conical-shaped, short-brimmed hat. This image of peasantry was far from the debonair attire that distinguishes the Chilean huaso of the last century. In the early history of Chile, there were sectors of land where the law could not be enforced. 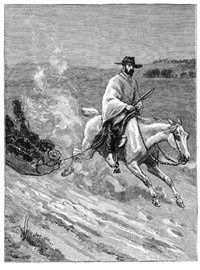 Bandits, cattle rustlers and contraband merchants that crossed the Andes were all commonplace. Back in those days, the huaso used a knife with a long white handle tucked behind the back of his belt. This was part of their traditional gear, much like the gaucho, who still incorporates it in his attire to this day. Ironically, the worse huaso bandits played crucial roles in disrupting the stronghold of the Spanish royalists, and thus made key contributions to the independence of the Chilean republic. Most of these lawbreakers gained heroic reputations after the war and settled down into more reputable positions in the society of the new nation. As law and order were established, a more tranquil atmosphere reigned in the Chilean countryside, and the sedentary, responsible, faithful huaso we know today began to take shape. This also coincided with the more formal rodeo competitions being defined within the medialunas (half moon arenas) that were influential in creating a much more elegant image of the Chilean horseman. By the end of 19th century, the image we hold of the huaso today was solidly becoming a part of the Chilean culture. In the early agrarian economy of Chile, the main exports were wheat, leather and tallow. The main region of development in the country was in the central area between the rivers Aconcagua and Bío Bío. Later, it extended itself farther south to the Chacao Channel. These areas were incorporated into the large colonial block that was referred to as the “Cattle Breeding Territories” by the conquering Spaniards. They extended themselves over the Andes northward to Asunción, Paraguay, eastward to Montevideo, Uruguay, and southward covering a great deal of the central part of Argentina that revolved around Buenos Aires. With cattle breeding becoming the mainstay of these regions, the huaso culture in Chile was evident across all societal levels. With landowners who lived on their properties, the lifestyle of the huaso-employer and huaso-employee did not differ that much. Granted, I use these terms in a retroactive sense, as the word huaso was not yet a part of the Chilean lexicon. Still, what we are concerned about is that consummate horseman by whatever name we wish to describe him. Both the hacienda employer and employee rode the same kind of horses, used similar attire and had houses made of the same construction materials. They had the same passion for the country life, the livestock industry and for the rodeo and reining competitions. They were conservative in their outlook on life, with strong nationalistic feelings for the country they proudly felt a part of. They made a united front against the vandals, cattle rustlers and vagabonds that threatened the stability of their families, but were largely pacific and non-intervening in nature. They were family men and were concerned about educating their children in being both scholarly and polite. Huasos of all social levels cared about being informed on the world around them, but little did this knowledge sway their opinions of the kind of life they felt was important to them. Whether as a requirement for participation in rodeos, or to fulfill the personal pride displayed in public, huasos of all walks of life made a point of always having a clean and neat appearance. Until the end of the 19th century, this camaraderie between the huasos had precedence over the laborer relationships. Commitments between the employer and the employee were very loosely defined, and little changed as the relationship crossed over from work to sport through their common interest in the rodeo. Even as the progress of Chile began to tempt landowners to live away from the farm in the convenience of the larger urban areas, the bond of competing together in rodeos has to this day established a faithful working relationship between huasos of different social status. It was this bond of fidelity that made the huaso brigades that participated in the Pacific War of 1879 so successful. These improvised soldiers gave their all as they followed their employers into battle with a sense of allegiance to the common friend they had back in the hacienda. Of course, over time, a higher proportion of absentee owners in Chilean agriculture created an unfortunate lack of identity in the labor relationships. Still, even to this day, the manner of bridging this gap is for the hacienda owner to maintain a small stable of horses where he can participate in the local rodeos. Once the employer and employee have their hats, ponchos, leggings, boots and spurs on; a bond that is as old as Chile itself overrides all social differences and job descriptions. Invariably, participation in this, Chile’s second most popular spectator sport (only soccer has more fans), infects the participants. This is but the beginning of a lifelong addiction to the competition, to a network of friends and to the appreciation for these powerful little horses so full of heart. It is this fact that has Rodeo competitions full of entrepreneurs, executives, doctors, lawyers and just about any other imaginable line of professional. In the presence of that medialuna, the huaso mentality overrides all other insignificant details regarding the participants.